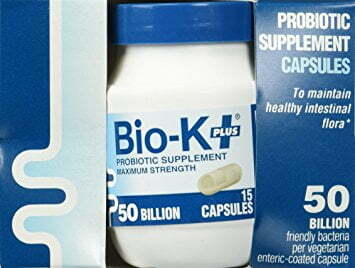 Bio-K Plus Probiotic Supplement Capsules are the capsule form of Bio-K’s probiotic blend, which is more typically packaged in yogurts, kefirs, or other food-like supplements. They include three strains of lactobacillus in enteric-coated capsules, and have whopping 50 billion CFU in each. These strains are often associated with treating antibiotic related diarrhea, general bloating and discomfort, and overall immune health. 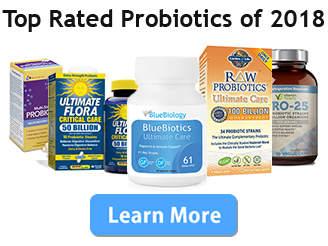 They are the basic, down-to-business strains that are absolutely necessary for intestinal health, and as such users can expect regulated bowel movements and an overall improvement in immune function. 50 billion is a relatively high CFU count, although it is possible to get more from some higher-rated brands. With the lactobacillus focus, this is the probiotic we’d recommend for regulating bowel movements and general bathroom discomfort. Bio-K unfortunately lacks the diversity necessary to thoroughly populate the intestine and adequately support the body’s immune response. With only three strains, this remains a very basic probiotic and is unlikely to give users the results they would like. Bio-K are available online. To find more information on where to buy, visit their website: biokplus.com .